The 2019 Toyota Tacoma pickup truck has its work cut out for it, and we’re not just talking about how its owners may use it. Over just a few years, the Tacoma went from having just one rival—the Nissan Frontier—to enough to keep cross-shoppers on the test-drive circuit for the better part of a week. 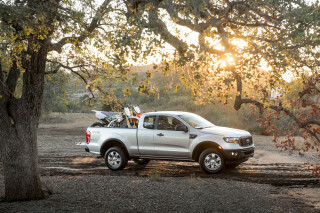 Now, a reborn Ford Ranger is the next to try to topple the Tacoma. 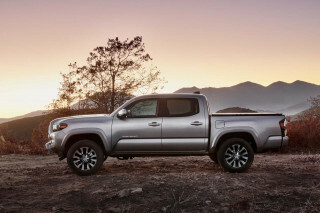 Toyota sells the Tacoma in SR, SR5, TRD Sport, TRD Off Road, Limited, and TRD Pro trim levels. Most use a reasonably strong 3.5-liter V-6, but base models can be ordered with a lackluster inline-4. The V-6 provides good, but not great, acceleration and is available with either 6-speed manual or 6-speed automatic transmissions. Rear-wheel drive is standard and four-wheel drive is optional on most trims, but is mandatory on others. Sharper steering than in most pickups is paired to a ride that’s bouncy-soft in some trims and surprisingly firm in others. 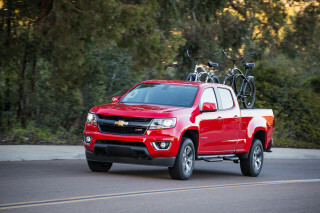 The Tacoma’s 6,800-pound towing rating is good, but no match for full-size pickup trucks. 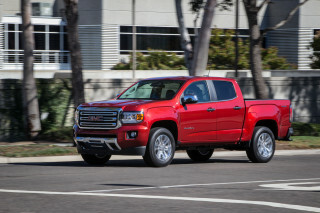 Fuel consumption is typical for a mid-size pickup; most versions have EPA combined ratings of about 20 mpg. The Tacoma’s blunt exterior styling is paired to a car-like dashboard inside. Unfortunately, the legs-out seating position and limited head room are more akin to a sports car than a pickup, too. The lack of a height-adjustable driver’s seat would be a head-scratcher at half of the Tacoma’s cost. The hefty price of admission is offset by stellar resale values and a high level of standard active safety tech on every trim: automatic emergency braking with pedestrian detection and adaptive cruise control come on every Tacoma. Don’t look for Apple CarPlay or Android Auto compatibility, however. With its upright front end, high-riding stance, and flared fenders, the 2019 Toyota Tacoma won’t be confused with its mid-size pickup truck rivals. The Tacoma is available in extended and crew cab configurations, the latter of which is far more popular with buyers. Extended cabs have a 6-foot bed. 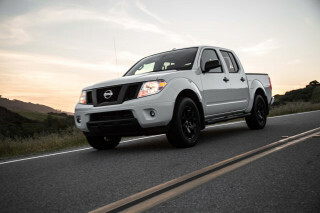 A 5-foot bed is standard with crew-cabs and a 6-foot bed is optional. Up front, the Tacoma’s tall grille sits almost vertical. It’s flanked by headlights that sweep back into the fenders. From the side, the Tacoma’s big wheel openings are surrounded by fender flares painted on some trims and left gray on others for a more rugged look. A kick-up in the Tacoma’s window sill at the rear ties it in with its Toyota truck predecessors. From the rear, the Tacoma is typical pickup with a bed that hangs well past the rear wheels, although the stamped tailgate is a nice touch. All Tacomas ride fairly high, but TRD Off Road and TRD Pro trims look like a Prius could tuck underneath for the night. Inside, the Tacoma’s upright theme continues with its dashboard. A touchscreen for infotainment sits high for easy access with climate control knobs and a row of switches below. Toyota paid attention to the details with various surface textures and contrasting stitching throughout, but the overall look is more functional than memorable. The black headliner included in most higher-trim Tacomas exacerbates an already cramped interior, giving it a coal bin look and feel. The high-riding 2019 Toyota Tacoma is best experienced in its myriad off-road trims, where its ground clearance is matched by its capability. A 2.7-liter inline-4 rated at 159 horsepower is standard, but most buyers smartly upgrade to the 278-hp 3.5-liter V-6. Most V-6 Tacoma trims come standard with a 6-speed manual transmission and offer a smooth 6-speed automatic as an option. The inline-4 is just adequate for in-town use and is overworked on the highway lugging more than two tons of pickup and passengers. The V-6 doesn’t provide great power off the line, but it’s smooth and returns about the same fuel economy as the base engine. Most buyers will probably opt for the automatic, which can be too eager to upshift to save fuel. We like the manual transmission, even if its long throws remind drivers they’re in a truck and not a sports car. Tacomas ride on a separate ladder frame with a leaf-sprung solid rear axle and an independent front suspension. Most models have a bouncy ride that can be tiring on a long highway slog, but the Fox shocks on the TRD Pro are tuned to be unusually stiff. They soak up big bumps well, but the ride inside is trucky and firm. Even rear-wheel-drive Tacomas sit high off the ground. The popular four-wheel-drive system works via a simple knob, but there’s no full-time four-wheel-drive mode for use on dry pavement. Opt for a Tacoma TRD Off Road or TRD Pro and the Tacoma has a full suite of four-wheeling gear: a push-button locking rear differential, a crawl control system that lopes the pickup along at walking speeds, hill-descent control, and five off-road traction control modes. When properly equipped, the Tacoma can haul 6,800 pounds’ worth of trailer. That’s enough to confidently lug a small utility trailer, but those who routinely tow larger loads will be better off with a full-size truck. It’s not obvious at first glance, but the 2019 Toyota Tacoma does not make an especially good people-carrier. Its low roofline and high floor combine for less vertical space, something every passenger will notice the first time they climb aboard. Up front, the Tacoma’s seats are padded well enough, but even the costliest trim lacks height adjustment and the low front seats provide a legs-out driving position. That makes some sense when you consider the Tacoma’s weak head room, especially with the optional power moonroof. In extended cab configuration, the rear-hinged back doors open to reveal space best for storing items, not people. Crew cabs are better, but their rear seats are upright, leg room is limited, and they suffer the same weak head room as the front seats. Extended cab Tacomas come with a 5-foot short bed, while crew cabs can be ordered with either the short bed or a 6-foot long bed. The Tacoma’s interior has a sturdy feel with attractive textures and colors, but soft-touch trim is in short supply. A four-star overall rating from the NHTSA is enough of a blemish to erase the impressive array of active safety gear on the 2019 Toyota Tacoma. Every Tacoma leaves the factory with automatic emergency braking with pedestrian detection, adaptive cruise control, and lane-departure warnings. Blind-spot monitors are optional on higher trim levels. That impressive tech isn’t even an option on some rivals. 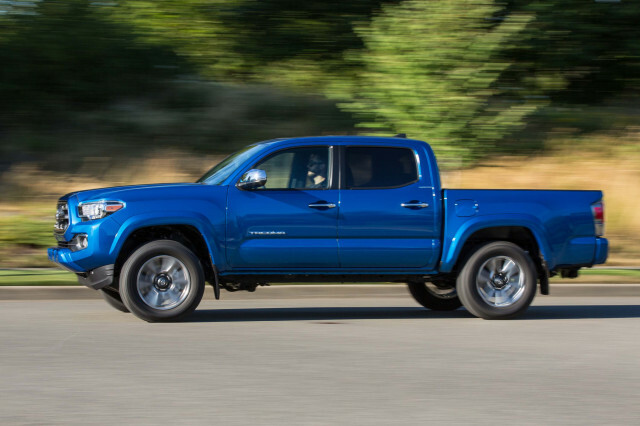 The IIHS had positive things to say about the 2019 Tacoma in both extended- and crew-cab configurations, giving it a “Good” score in every instrumented crash test and a “Superior” rating for its collision-avoidance tech. Only headlights rated “Marginal” in all trims held it back from a Top Safety Pick award. The feds weren’t as complimentary. They rated the 2019 Tacoma crew cab at four stars overall. The NHTSA has not tested the extended cab. The base Tacoma SR costs about $25,000, but it’s short on features aside from a 6.1-inch touchscreen for infotainment and active safety tech. Even rear seats are optional on the extended cab version. Most buyers will probably step up to the SR5. With the crew cab and 5-foot short bed, the Tacoma SR5 costs about $28,500 and adds power features, upgraded interior trim, a chrome rear bumper, and a few other features. The V-6 engine ups the price to about $32,000, while four-wheel drive brings the Tacoma SR5 to about $34,700. Our money would be on the Tacoma TRD Off Road. For about $36,500, it adds alloy wheels, keyless ignition, a 7.0-inch touchscreen for infotainment with navigation, a locking rear differential, a few off-road goodies. We think it’s a better value than the $43,000 TRD Pro with its stiff Fox shocks, all-terrain tires, and thick skid plates. For on-roaders, the Tacoma Limited costs about $40,500 and features leather upholstery, dual-zone automatic climate control, blind-spot monitors, and 18-inch alloy wheels. Overall, the Tacoma is a decent value for a mid-size pickup truck—especially once its impressive resale value is factored in. 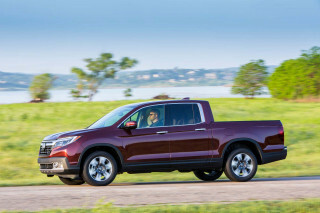 However, no Tacoma can be had with a height-adjustable driver’s seat or Apple CarPlay and Android Auto compatibility, demerits that are hard to overlook. Surprisingly, the thriftiest Tacomas are not necessarily 4-cylinders, depending on how they are driven. The base engine is rated at 20 mpg city, 23 highway, 21 combined compared to 19/24/21 mpg for V-6, automatic Tacomas with rear-wheel drive. With four-wheel drive, the Tacoma’s 4-cylinder sinks to just 19/22/20 mpg versus 18/22/20 mpg for the V-6 four-by-four. Manual transmission Tacomas are the thirstiest in the lineup at 17/21/18 mpg for the crew cab and 17/20/18 mpg for the slightly less aerodynamic extended cab. Unlike the Chevy Colorado and GMC Canyon, no Tacoma turbodiesel is available.